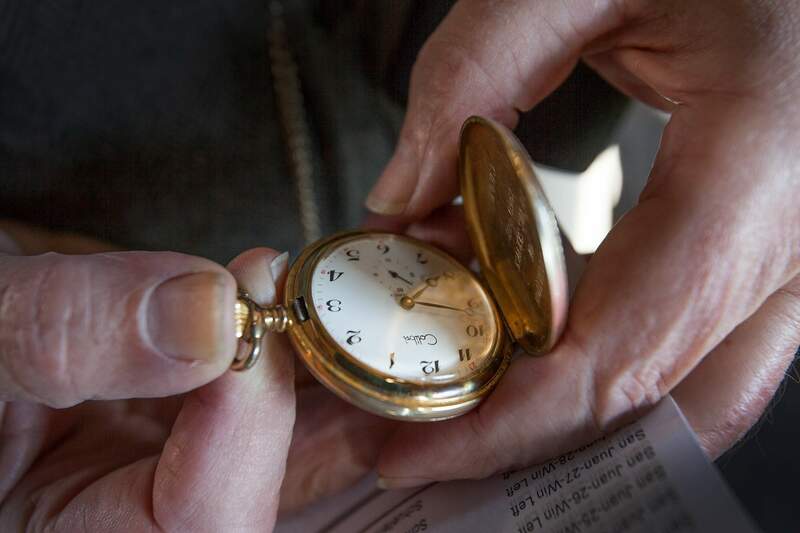 It’s not every day that a history buff can relive the era that fascinates them most. That is, unless you’re a Victorian narrator on the Durango & Silverton Narrow Gauge Railroad. “This is the best job I’ve ever had,” said Carrie Foisel, who has worked in theater productions, retail stores and, most probably the most laborious, raised four sons. History as a passion is a common thread for the seven narrators for the railroad, who dress in Victorian clothing as they ride the rails. Al Harper, owner of the D&SNG, said the program started about five years ago. “For years, people wanted us to have microphones and do tours of the train,” he said. “But I always felt like that modern convenience aboard the train detracted from the original 1882 experience. Narrators are a sort of self-run operation, Foisel said. They pick their own characters, do their own research, create their own costumes, and are encouraged to add their own flare to the performance. Foisel, 58, has participated every year since the program began, and has a bag of characters she can choose from, such as Victoria Day, whose husband ran the Durango Democrat while she tended to the ranch, and Olga Little, who used a burro to haul supplies to miners. Her favorite portrayal, her great-grandmother Grace Cotton, hits a little closer to home. Indeed, Alan Sabo, who portrays Durango’s first marshal, Robert Dyer, has a few on the tip of his tongue. Sabo, 70, even wears cologne that was popular in the late 1880s. “You spend enough time on Google and you can find almost anything,” he joked. Sabo said Dyer moved down to ranch the Animas Valley after trying his hand at mining, and was asked to become marshal in 1881. After getting shot at the Cabinet Salon, Dyer quit, sold his property and opened Durango’s first bowling alley. Stories like these give color to the rider’s experience, Gay Kiene said. Her own character, Caroline Romney, moved to Durango when she was 40 as a widow, and started Durango’s first newspaper. And, the job offers a good opportunity for retirees, Ray Mayer said. A Durango resident since the mid-1980s, Mayer, 77, started narrating after he retired from a career in law enforcement. Durango, like most outpost Western towns, was influenced in every way by the Victorian age, including food, dress and morals, said local historian Duane Smith. The style lasted until the 1920s, he said. Yet the train captures that unique time when Durango and Silverton were in their so-called formative years, Foisel said. Train Narrators Narrators on the D&SNGRR bridge the gap of a cenury of local histoory for passengers on the Summer train to Silverton. Narrators on the D&SNGRR bridge the gap of a cenury of local histoory for passengers on the Summer train to Silverton. Carrie Foisel, a narrator with the Durango & Silverton Narrow Gauge Railroad, awaits passengers inside the San Juan Car on Tuesday before the train’s departure to Silverton. Foisel’s plays the character of Victoria Day, the wife of a Durango newspaper man and a rancher at the end of the 19th century and the early 20th century. Photo by Shaun Stanley/Durango Herald. Carrie Foisel, a narrator with the Durango & Silverton Narrow Gauge Railroad, greets passengers inside the San Juan Car on Tuesday before the train’s departure to Silverton. Foisel’s plays the character of Victoria Day, the wife of a Durango newspaper man and a rancher at the end of the 19th century and the early 20th century. Photo by Shaun Stanley/Durango Herald. Carrie Foisel, a narrator with the Durango & Silverton Narrow Gauge Railroad awaits passengers inside the San Juan Car on Tuesday prior to the train’s departure to Silverton. Photo by Shaun Stanley/Durango Herald. Charles DiFerdinando watches the morning departure of the Durango & Silverton Narrow Gauge Railroad on Tuesday. DiFerdinando works as a narrator on the train. He portrays Thomas Graden, a Civil War veteran and 19th century Durango businessman. Photo by Shaun Stanley/Durango Herald. Carrie Foisel, a narrator with the Durango & Silverton Narrow Gauge Railroad, awaits passengers inside the San Juan Car on Tuesday prior to the train’s departure to Silverton. Photo by Shaun Stanley/Durango Herald. Carrie Foisel, a narrator with the Durango & Silverton Narrow Gauge Railroad, greets passengers inside the San Juan Car on Tuesday prior to the train’s departure for Silverton. Photo by Shaun Stanley/Durango Herald. Charles DiFerdinando checks his watch inside the San Juan Car of the Durango & Silverton Narrow Gauge Railroad. Photo by Shaun Stanley/Durango Herald. Carrie Foisel, a narrator with the Durango & Silverton Narrow Gauge Railroad, awaits passengers inside the San Juan Car on Tuesday before the train’s departure to Silverton. Foisel’s plays the character of Victoria Day, the wife of a Durango newspaper man and rancher in the late 19th century and early 20th century. Photo by Shaun Stanley/Durango Herald. 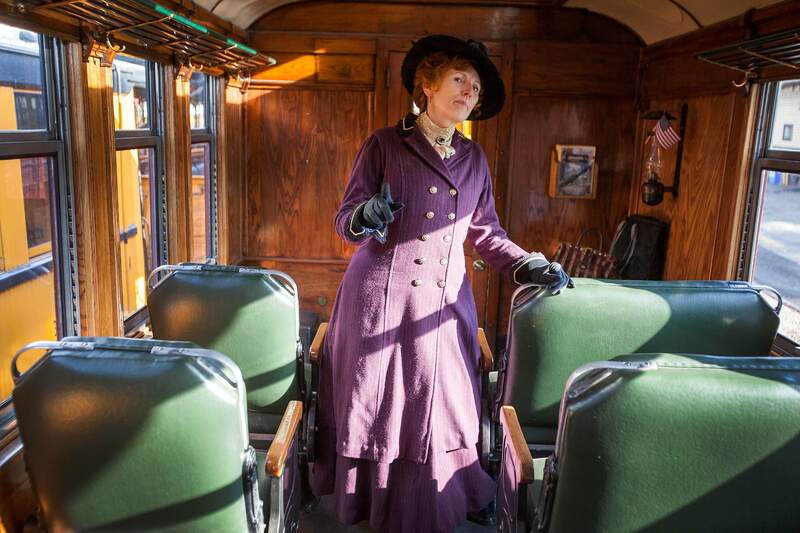 Carrie Foisel, a narrator who relates stories from the Victorian era for the Durango & Silverton Narrow Gauge Railroad, awaits passengers inside the San Juan Car before the train’s Tuesday departure to Silverton. Foisel plays the character of Victoria Day, a rancher and the wife of a Durango newspaper man at the turn of the century. Charles DiFerdinando checks his watch inside the San Juan Car of the Durango & Silverton Narrow Gauge Railroad. DiFerdinando works as a narrator, telling stories on the train from the Victorian era. He portrays Thomas Graden, a Civil War veteran and 19th century and early 20th century businessman in Durango. 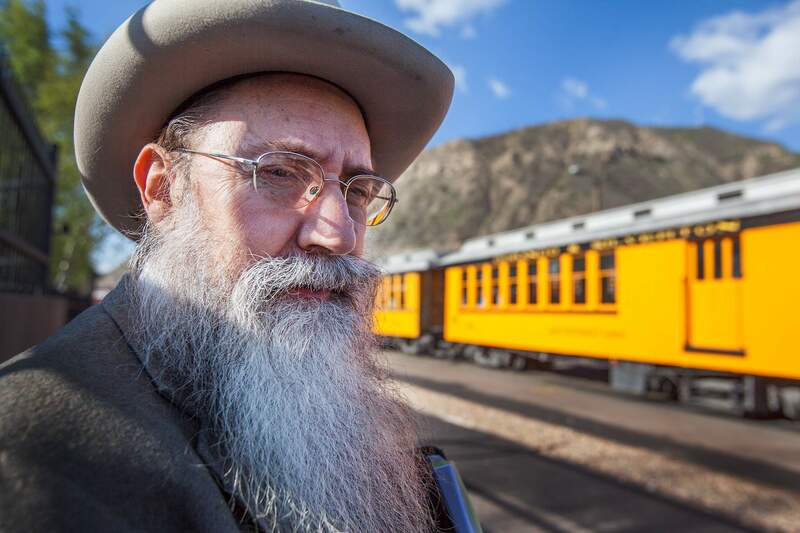 Charles DiFerdinando watches Tuesday morning’s departure of the Durango & Silverton Narrow Gauge train to Silverton.